People share the content that they discover 36 billion times each month on the largest social networks (30B on Facebook, 5B on Twitter, 1B on Google+). Increasingly, search engines weigh this social sharing when determining how to organize content in search results. 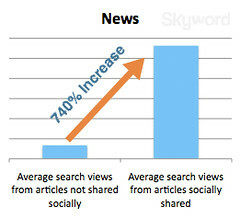 Equally important, when content is found more frequently in search, it’s more likely to be shared. This social-search feedback loop plays a large role in determining the audience generated by an individual piece of content. But how big of a difference does sharing content make? Is it worth the investment? Until now, it’s been hard to quantify the impact of the search-social feedback loop. 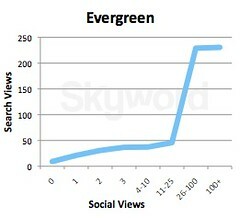 With thousands of news and evergreen articles being published each month using Skyword’s content production platform, we’ve amassed data that clearly demonstrates that the feedback loop exists and that its impact is significant. 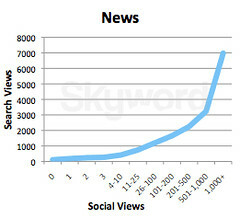 The social sharing of content increases that content’s social rank. Search engines place content with a higher social rank more prominently in search results, driving higher search traffic to it. Content appearing more prominently in search results is more likely to be discovered by consumers and promoted socially by them. 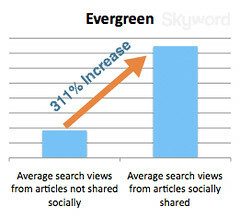 Search-optimized content, therefore, is more likely to be socially promoted. The lesson for media companies and content marketers is clear: content authors should be encouraged to promote their own content socially, leveraging their personal social graphs to improve the search performance of that content.